Highland Park, which opened in Woodland Heights in 1903, was developed by the private Houston Electric Company, which then controlled Houston’s streetcar system, to encourage ridership on its new extension up Houston Avenue. At the time, Houston’s first public park, Sam Houston Park, was the only other large park in Houston. 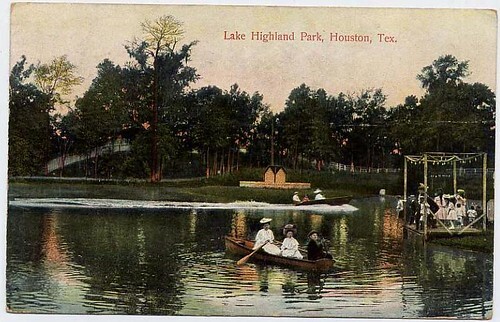 Highland Park would ultimately become Houston’s second public park – the park now known as Woodland Park. Other groups holding picnics at the park in its opening weeks were the Painters Union and the Houston Civic Club’s First Ward Division. The Painters Union’s entertainment program included James E. Black, a “singer, dancer, and acrobatic high kicker without legs”; and Charlie Ward, described as “Comedian: blackface specialty.” However, dancing was the evening’s main feature. In its early days, the park’s primary attraction was a dance pavilion, where patrons would waltz and two-step. The park had its own band, the Highland Park Band, made up of about 20 musicians. By August 1903, a gravel path had been added between the streetcar stop and the pavilion, but work continued on the park. In the winter months that followed, most press coverage related to the park was devoted to the Highland Park Gun Club, which held shooting tournaments at the park’s gun range. Adding grace and beauty to the park are great, tall, towering majestic pine trees and shrub oaks, wierdly beautiful with a fantastic drapery of moss suspended from their branches and festooned around their boughs, bidding a fond welcome to the visitor and offering a cooling retreat from the burning rays of Old Sol. Situated on a grassy eminence fifteen, feet higher than any other spots in Houston the first structure that meets the eye is a large and commodious cafe and buffet building with a capacity to feed and entertain 1,000 people. Broad, wide galleries surround this building on all aides, where cooling drinks and refreshments are served at all hours at reasonable prices. This building commands a fine view of the park and adjoining country and its galleries rest on the edge ot a bluff overlooking the valley wherein sparkle the waters of a lake, dotted here and there with islands, while a gasoline launch and numerous pleasure boats dart hither and thither, forming a scene of animation and enjoyment exquisitely beautiful. Nestled between the hills fifty feet below the cafe and buffet building, with the rays of the sun glittering and sparkling upon its clear transparent surface is a lake of exceptional beauty and picturesqueness. Surrounding the lake on all sides are comfortable tree seats and rustic benches where the pleasure seekers, wishing to rest, may have ample opportunity. Special anangcments have been made with the United States Government whereby 50,000 fish, including the big-mouthed bass and trout, are to be shipped from the United States fish hatcheries at San Marcos to stock the waters of the lake and bayou. In a year or two, when these game members of the finny tribe have attained their full growth, the lake will afford the finest fishing to be had in this section. A few yards from the edge of the lake is an artesian well 478 feet deep, which has a flow of 75,000 gallons daily, furnishing patrons of the park with pure crystal mineral water. The water was tested by a chemist and found to contain a certain per cent of lithia, thus giving it curative properties of exceptional value. Arc lamps are distributed throughout the grounds, and thousands of incandescent lamps are suspended from wires overhead, lighting up the lanes and places of amusement and sparkling like millions of fireflies in the darkness. The surface of the lake, shining and glimmering in the moonlight, reflects the myriad electric lights, the pleasure boats with their gay occupants and the shadows of the great pine trees lend a touch of mystic enchantment to the scene. On the largest Island, which is situated in the center of the lake, is a circular band stand connecting with the main land by rustic bridges, which span the lake on either side. 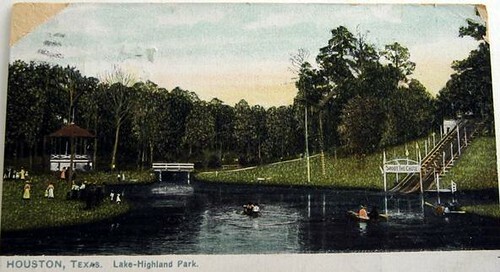 Some of these park features can be seen in the Highland Park postcards above. Houstorian has found no online photographs of Highland Park, though some may exist in a library collection and/or Houston newspaper archives. Also, a 1904 newspaper article about the park noted that an automobile party that included Baron Masanao Matsudaira and Harvey T.D. Wilson (who had an interest of some sort in the Japanese colony in Webster) took “kodak pictures” of the park, using Mr. Wilson’s camera, on June 19, 1904. So photographs of the park may exist somewhere. By June 1904, a number of unions had placed Houston Electric Company on their “unfair” list, and begun fining members seen riding the streetcars or visiting Highland Park. One of the unions’ complaints against the company was that it was not hiring union labor at Highland Park. On July 7, 1904, a streetcar returning from Highland Park was dynamited. The car was thrown from its track, one of its wheels was blown off, and its glass windows shattered, raining glass on its full load of passengers. Remarkably, though, none of the riders was injured, a fact deemed “little short of miraculous.” The attack was one of a number of similar incidents around the same time period, all of which were blamed on union interests. Despite ongoing labor problems, including a strike of streetcar operators and workers, improvements at Highland Park continued. 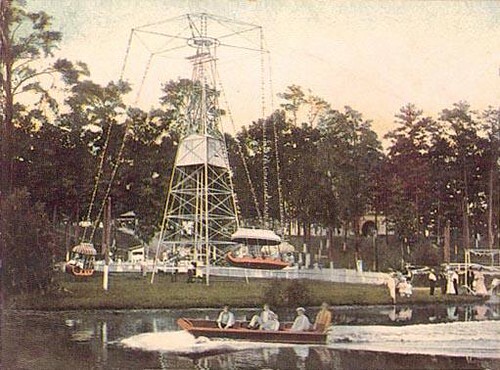 A “shoot the chutes” attraction was added in 1904, as pictured above. A “museum of natural history” – sometimes referred to as the Natural History and Fish Museum – was also added in 1904. In October 1904, charges were filed against Fred Bishop, the park’s manager, for allowing a theater production to be presented on a Sunday. A newspaper account noted: “The laws covering the case are peculiar and prosecution difficult if any offense exists.” The charges were ultimately dismissed on the grounds that no admission had been charged for the theater production. The “roller coaster” was the leading attraction. The cars were filled from the start, and be it known that boys were not the only patrons, for many men of various ages clamored for seats in the “coasters.” The ride is thrilling in the extreme, but is so smooth and pleasant that there is never a jar of the nerves, though they are essentially tense. The coasters are hauled up a steep incline about fifty feet by a chain belt run by an electric motor. The coaster is then released and Newton’s law does the rest. You plunge forward at a most thrilling gait and many are the ups and downs, ins and outs, but all pleasant, before the end is reached. The ride is calculated to cure a malady of most any kind, mental or physical. It simply puts new vigor in the heart and new speed through the veins. Its exhilirating effects are almost instantly noticeable. Should a patron mount a car with his blood flowing sluggishly, his heart beating slowly and away down in his shoes, when he whirls through the air up and down, round and round, and alights from the car he will be a new man, and his best girl will be in love with him. It is a panacea for almost any trouble, mental or physical. In November 1905, Houston Electric Company sued Highland Park manager Fred Bishop for past-due rental payments, plus $30,000 in damages for violation of the parties’ lease agreement. The alleged violation was supposedly Bishop’s “admission of improper characters to the park.” M.C. Michael took over the lease in 1906. 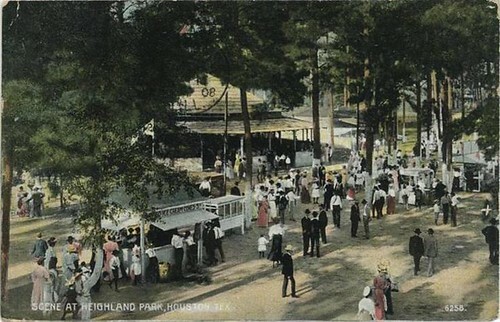 The park continued to operate as Highland Park until no later than June 1908, when it was reopened as “San Jacinto Park” under the auspices of the Houston Civic Club. The new name was confusing because there was already a park at the San Jacinto battleground, and it does not appear to have gained acceptance. 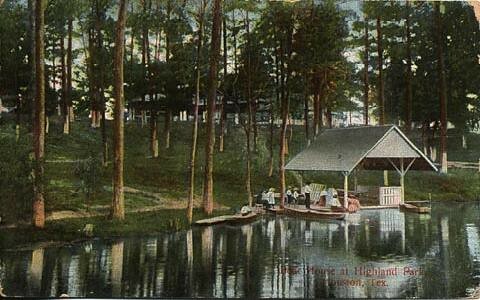 The city of Houston purchased the park in 1911. In 1914, residents of the Woodland Heights neighborhood, which was platted in 1907, successfully petitioned to have the park’s name changed to Woodland Park. There are still reminders of Highland Park in Woodland Heights today. There is of course Woodland Park itself, which Houstonians continue to enjoy. But there is also, a block to the west, a nursing home named “Highland Park Care Center”. And a Highland Street a few blocks to the north. This entry was posted in Amusement Parks, Heights. Bookmark the permalink. This is very interesting as this park has had 3 different names in 107 years. There have been a few of Houstons older park areas that have been covered over by buildings or roads. I have a picture on my grandparents on Grover’s side of Walton and Anna Laura Talyor on the lake at Woodlawn Park. I will try to post it here. Also go to trooperkeeton.com for more on the Bayou City. I have recently come across five pictures of High Land Park taken by my grandfather Arthur H. Stenzel in 1906. If interested in copies let me know. Ralph- I am a resident of the Woodland Heights, part of the original Highland Park addition. I would love to receive and forward your and anyone else’s photographs of Highland Park to the Friends of Woodland Park. When I get back in town I’ll scan them and send them to you. Thank you! In the meantime, please visit friendsofwoodlandpark.org. Thanks again! Melissa, I just sent you the photos. 28 Jun 2014 2 PM. Enjoy! this is quite interesting about the roller coaster in particular. my Granddad told me decades ago of an automobile roller coaster which operated in that area(?) which he said he rode when he got his first HL&P “company car”. He said he was having a great time until he looked in the rearview mirror and saw his boss in the car behind him! wonder if that happened in the early 1930’s?